Fi Dan Lo, 28, is a diabetes program coordinator at Sacramento's Hmong Women's Heritage Association. Lo's helped conduct community surveys and focus groups about diabetes in the region's Hmong community, and says the disease is rampant. "Our community survey said that more than 20% of our individuals had diabetes in the Hmong community," says Lo. Lo has personal experience with the disease. His father, 55 year-old Chia Chao Lo, has been struggling with the disease since 1985. Fi Dan grew up in Sanger, California with his father and the rest of the Lo family. He visits them often. On this Saturday morning in Sanger, Fi Dan sits on the couch while his father, Chia Chao Lo gives his 11 year-old adopted daughter math and French lessons. Fi Dan remembers when he received the lessons. "Before I went to preschool, he made sure I knew all my ABCs. I knew how to count to 100 and I knew all my shapes and colors." Fi Dan's dad is from Laos in Southeast Asia. He was enlisted by the U.S government to serve against the communists during the Vietnam War. He and many others came to the US from a refugee camp in Thailand in the 1970s. There are almost a quarter of a million Hmong people living in the United States, many of them settled in California's Central Valley. Fi Dan helps translate his dad's story. "They heard that in America there were really good opportunities for achievement or education," says Fi Dan. "So he wanted to come first for that and secondly he wanted to come to escape the communists." 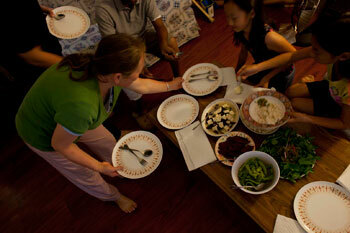 The Lo family lives in Sanger, a rural community just outside of Fresno. The family has about an acre of land to farm, some chickens, and a few dogs. Fi Dan's mother, Pa Vang Lo, is proud of the gardens that wrap around the house. Mrs. Lo says they grow all the vegetables they eat. Corn, green beans, sweet potatoes, mustard greens. She's a busy woman. She works as a full time nutrition aide, cooks, cares for their daughter, runs the garden and takes care of her husband. He was diagnosed with diabetes about ten years after they moved to the US. As Mr. Lo sits on a couch in their living room, his wife helps take his blood pressure. Mr. Lo is wearing a camouflage cap, khaki pants and a grey polo shirt. He's a thin, small man. He points to his sagging left eye. "This one is plastic now. Blind. Left eye blind," he says. "It was bleeding a lot in his eyes," says Mrs. Lo. "So that's why they do the surgery, it's caused by the diabetes." Diabetes also caused Mr. Lo's kidneys to fail years ago. Since then, he's been dependent on dialysis. He chooses to do the treatment at home - four half-hour sessions a day. First Mr. Lo drains yellow waste fluid using a tube attached to a hole in his abdomen. 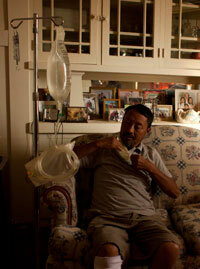 Then he introduces a fresh bag of dialysis fluid into his body, and it and sits there until the next dialysis treatment. The process removes toxins from the blood, a job healthy kidneys normally do. The health complications of diabetes largely keep Mr. Lo housebound. "I still have kidneys in there, but [the] kidney[s are] dead," says Mr. Lo. Many Hmong say they didn't know diabetes back in Laos and Thailand. Mr. Lo says food, physical activity, and health, is all different here in the U.S. Fi Dan interprets for his father. "In Laos, they had to walk a lot. They didn't have cars, so everywhere they went they just had to walk. He also said that as soldiers, and even in Laos, it's a poor country so they didn't have a lot to eat in a ways and they did a lot of physical activities. In contrast, coming to the United States, everywhere you go you don't get to walk a lot. Everywhere you go, you go into your car, you just drive every place you go. [He also says] The food here, they make it too good. There's a lot of fat in the meats they have here. The food, they use preservatives for the food...He says that once they came here, those foods taste way better than what they had in Laos, so they consumed more, and they also consumed more sweets like sugary drinks." After his diagnosis, friends and family encouraged Mr. 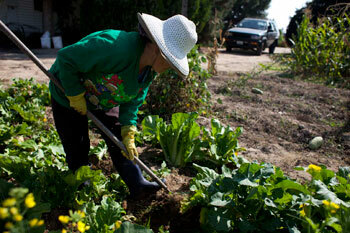 Lo to use traditional Hmong healing practices. At first, they got help from a shaman, and used herbal remedies. Fi Dan translates again for his father. "Our Hmong belief system was that maybe it's because of your spirit, or maybe it's because of something you did, or maybe it's because your ancestors are not happy with you. So you have to do maybe a spiritual calling or shamanistic rituals to try to remedy those things. But he said that even after all of those, it didn't work. So the Hmong people would be like maybe you need to try these types of herbal medicine or these roots types of medicine from trees or stuff to help you out. But after he took a lot of those, it also didn't help him." Mr. and Mrs. Lo have embraced western medicine, and say they've abandoned the spiritual healing practices of the Hmong. But Mr. Lo occasionally tries new herbal remedies, and that's one reason there's sometimes tension between the couple. While Mrs. Lo chops beans from her garden for a Saturday morning meal, she explains how cooking for her husband's health has required some experimentation. "I learned that each time he eats the regular rice, it makes his sugar go up way, way high and sticky rice is make it more higher, and that sugar stays more longer. But when I change my way to be like brown rice with almost two meals or three meals, we are able to control his sugar way down." Mrs. Lo says she's the one who likes change. Her son says she was one of the first people in their community to cook brown rice for the family. But they didn't always like it. Mrs. Lo not only had to learn how to make healthier food, but how to get her husband to eat it. "So what I do for him, I don't really tell him that this is only for you but I say 'It's for family but you need to eat a little bit more,'" explains Mrs. Lo. "So every time I make meals I don't make special for him. Everyone need to eat the same." But Mr. Lo still has an appetite for unhealthy foods, a tendency his wife is constantly keeping in check. Ultimately he realizes, she's keeping him alive. He says he knows many people who went on dialysis after he did, who have passed away. Fi Dan Lo interprets for his father, Chia Chao Lo. "When he finds out that a lot of his age group has passed away, he feels they didn't have a really strong support group. He said that their wives must not take care of them as well as my mom has taken care of him, and that's probably why they've all passed away before he has." Fi Dan Lo lives in Sacramento now with his own family, but he visits his parents in Sanger often. His father's passion for teaching, and his health problems, inspired Fi Dan to get an advanced degree in public health. At the Hmong Women's Heritage Association in South Sacramento, Fi Dan heads up research and grantwriting for their community diabetes work. He knows from experience that it takes a lot to manage, and reverse chronic disease. "If you want to treat somebody with diabetes then, really, your environment has to change and it starts with your family," says Lo. Through surveys and focus groups, the Hmong Association gathered much needed information to help combat diabetes in their community. Lo says community members would like to see more programs or activities for the elderly Hmong population. "They want a safe place to exercise. They also want a safe place to just mingle and socialize," says Lo. In late October, a community health worker named Youa Lo led the Association's first diabetes workshop with Fi Dan Lo. More than 20 people attended. Most of them were diabetic. As they explained the basics of diabetes, the older crowd listened intently. None took notes, but they weren't shy about asking questions. "I didn't expect that many people to show up, and I didn't expect that response from the Hmong community because they're generally really, really shy. So they actually came out of their shell," says Fi Dan Lo. An English-speaking independent health educator showed simple ways to be more active at home. Youa Lo translated, using the English word for exercise. There's no such word in the Hmong language. Soon they were all on their feet, lifting arms and legs to music. "A lot of people were laughing, especially during the exercising routine because you know, they don't exercise much. So like exercising might be a little funny to them, but I think they enjoyed it a lot," says Fi Dan Lo. Fi Dan joined them in exercise. He was one of the youngest people in the room. "I think me and my dad, we are a lot alike," reflects Fi Dan. "We like to teach, we like to encourage people." Fi Dan says this is the first time people here have been taught about diabetes, and he hopes it won't be the last time they hear the health educators' words. "Don't let diabetes control your life, you control yourself. So don't let diabetes control your life." Dian Baker has been a pediatric nurse practitioner and community advocate for over 30 years. She holds two masters' degrees from California State University, Sacramento and earned her PhD from the University of Hawaii at Manoa. Baker recently completed a postdoctoral research fellowship at the Betty Irene Moore School of Nursing at the University of California, Davis where she studied health inequities among Southeast Asian communities. She is an associate professor of nursing at California State University, Sacramento and a member of the Center for Excellence in Developmental Disabilities at UC Davis MIND Institute. Baker can be researched at: dibaker@csus.edu. Cap Radio News: I'm talking with Dr. Dian Baker (PhD, BSN) of Sacramento State University's School of Nursing. She's been doing research in the Hmong community now for 20 years. Dr. Baker, thank you for being with us. How widespread is diabetes in the Hmong community here in California? Dr. Dian Baker: General estimates are that diabetes in the Hmong community is around 16-20%, which is almost double that found in the European-American community. One study in Minnesota, done by Dr. Herr actually indicated levels as high as 41%, either identified with diabetes or at significant risk, we call that a pre-diabetic state. So the impact is huge and growing.